"This is one of my favorite quick and easy last-minute dinners. I created this recipe while rifling through my pantry in search of a new simple and healthy dinner. I love this recipe because the possibilities and variations are virtually endless!" Heat olive oil in a skillet over medium-high heat; saute mushrooms and onions until lightly browned, about 1 minute. Add black beans, cilantro, salt, and pepper; saute until mushrooms and onions are lightly browned, 2 to 3 minutes more. Place tortillas in a clean, dry skillet. Evenly distribute mushroom mixture onto 1 half of each tortilla. Top filling with mozzarella cheese and lime juice; fold each tortilla over filling. 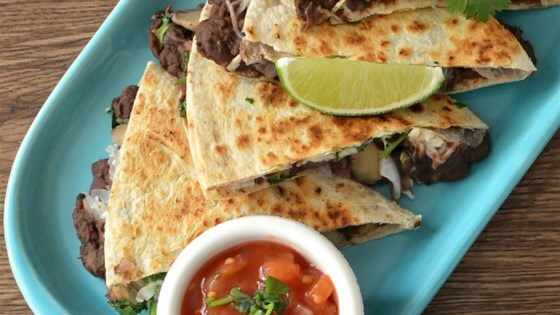 Turn burner to medium heat and cook until quesadillas are browned and crispy, about 2 minutes per side. Cut into wedges and serve with salsa. Any type of cheese can be used for this recipe! Anything can be added to this recipe to spice it up! Some of my favorite additions are corn, chicken, green chiles, tomatoes, yellow, orange, or red peppers, zucchini, and even black olives. A great blend of flavors with the mild creaminess of the melted mozzarella cheese allowing the flavor of the black beans to come through.